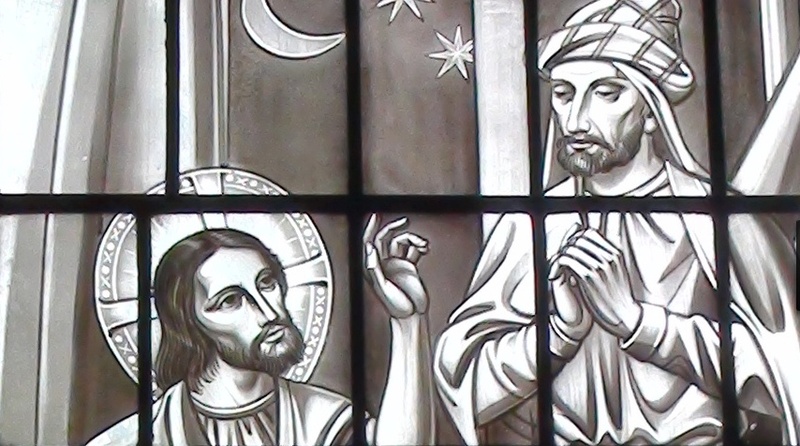 This entry was posted in easter, Inspiration, Motivational, Passionists, Religion, spirituality and tagged 3rd Sunday of Easter, doubting disciples, easter story, emmaus, Resurrection of Jesus on April 29, 2017 by vhoagland. This is one of the great statements in the Gospels which clearly indicates that the Passion and death of our Lord up on that cross was, more than anything, an act of Divine love, love for us, sinful humanity, so undeserving of His mercy. I walk in this world, seeing all the evil and darkness that cause so much suffering and death, and wonder why God has kept us from extinction for so long. I walk in the world, knowing that I have done various things that hurt others and myself, and although I am so grateful for all the wonderful things that God has given me in my life, I see that I did not deserve them. Frankly, if my life were to end in oblivion and darkness, I would not think it unfair. Yet I realize that I am so loved, with an immense love that is beyond my understanding. Why do you cherish us like this, my God? Creation already is so magnificent. Human life can feel so wonderful, even the simple act of breathing. And You, dear Lord, offer us an entranceway, a gate into yet another unexpected realm of existence beyond our comprehension : eternal life….. with You ! This entry was posted in Religion on April 26, 2017 by vhoagland. This evening at our mission at St. Theresa’s Parish in Staten Island, NY, I spoke about Jesus, the Teacher. I like Rembrandt’s drawing of Jesus preaching to a crowd. For one thing, the crowd around him seems to represent all ages, shapes and sizes of ordinary humanity. Jesus’ disciples, like Peter, James and John may be there, but they don’t seem to stand out. Maybe some of his enemies are there, but they don’t stand out either. They’re all there listening, except maybe the little child on the ground playing with something he’s found. And Jesus teaches them. Did Rembrandt find these faces in the people of his neighborhood, ordinary people? If that’s so, this crowd could be us. Luke’s gospel seems a lot like this painting to me. In much of Luke’s gospel Jesus makes his way from Galilee to Jerusalem, and as he goes his way he calls everybody to follow him. Some women from Galilee follow him. He calls Zachaeus, the tax collector, down from a tree to join him. Follow me, he says to a blind man begging in the same place for years. He called people in every shape and form, sinners, tax-collectors, everyone. It was not just to see him die that he calls them to follow him, but to go with him onto glory. “Come with me this day to paradise, “ Jesus says to the thief on the cross. Our creed says he descends into hell, which means he goes to those who have been waiting for centuries for the redemption he brings. He calls to all, to them and to us, to follow him. What does following Jesus mean? I spoke of two things. Jesus said to follow him we must take up our cross each day. He also said we must become like little children. He taught us about spiritual childhood. This entry was posted in art, Motivational, Passionists, Religion, spirituality and tagged Rembrandt, spiritual childhood, St.Theresa Parish, staten island, Staten Island Ferry on April 25, 2017 by vhoagland. Nicodemus reminds us that faith doesn’t depend on how sharp our minds are or how many books we’ve read. Faith is God’s gift to us. We are all still in the school of faith. On Friday of the Second Week of Easter we begin reading from John’s gospel about Jesus multiplying the loaves and fish near the Sea of Galilee. (John 6) There’s a lot of unbelief in the crowd that Jesus feeds, according to John. “Many of his disciples drew back and no longer went about with him,” . Besides those who radically reject Jesus’ claim to be the bread come down from heaven, others appear to have little appreciation for this great sign. Commentators suspect this this section of John’s gospel may indicate there were troubles over the Eucharist and over the identity of Jesus in the churches John is writing for. Most of the gospel readings for the last weeks of the Easter season are taken from the Farewell Discourse in John’s gospel. There too the disciples seem far from perfect. They’re fearful, they seem to understand Jesus so little. He calls them “little children,” not far removed from the children making their Communion this season. Perfect believers are few in the gospels of our Easter season. Plenty of imperfect believers, like us, which tells us that faith is something to pray and struggle for. More importantly, they reveal the goodness of Jesus, who gave the wounds in his hands and his side to Thomas, who never dismissed Nicodemus to the night, who came to table with his disciples and fed them again, who called them “his own” and prayed that they would not fail. We enter a school of faith in the Easter season where the Risen Christ speaks to us in signs like water, bread and wine, words that promise a world beyond ours and teach us how to live in our world today. He is our Teacher and Lord. This entry was posted in Religion and tagged Easter season, faith, First Communion, Gospel of John, Jesus Christ, Nicodemus, Passionists, Thomas on April 25, 2017 by vhoagland. The Archdiocese of New York has a renewal program called Revive taking place in its parishes this year. The program comprises a reading from scripture, a sermon on the purpose of life, a witness talk, prayers and hymns. This week, Monday, Tuesday and Wednesday evenings at 6 PM, I’m taking part in the Revive program at St. Theresa Church in Staten Island. I’m giving the sermon and will be offering some of the prayers. This entry was posted in art, Passionists, Religion, spirituality on April 24, 2017 by vhoagland. Find it where it’s planted. Find it where it grows. Find it where it bears fruit. Find it in the soil. Find it in the stem. Find it in the apple. It’s not to be held by any man. This entry was posted in art, Environment, Inspiration, Motivational, poetry, Religion, spirituality and tagged Catholic, faith, God, hope, Howard Hain, life, Lord's Prayer, nature, nothingness, prayer, truth on April 22, 2017 by vhoagland. When is it that we break-fast? Perhaps it is at morning Mass, when the long night of daily winter is slowly burned away by “the dawn from on high”. Perhaps it is there, at the altar of our Lord, at the breakfast table of our one united body, that we come to see the Crucified Christ truly risen and waiting for us, “standing on the shore”. We take so much for granted, so much we just assume is already prepared, without giving much thought to just how much goes into each meal. But we are in good company, Peter and the rest of the apostles, like us, come to a meal already in progress. And just as Jesus called the apostles to a new morning meal, He calls each one of us each new day to a meal prepared ahead of time—in fact it was ordained a long, long time ago—for even upon those hot coals which the apostles approached two millennia ago, fish were already waiting. It is to this ongoing meal that He asks all apostles to bring their fish, their most recent catch—to add to the fire—to the feast ever being prepared for those still yet to come. The Fisher of Men, who calls others to become fishers as well, asks His disciples to contribute not only their earthly catch but the eternal offering of themselves. But who is it that we find already lying upon the charcoal fire, upon the table of the Lord, waiting for us each morning as we approach the altar with our daily catch? Is it not all those who have walked in faith before us? Is it not the communion of saints, the cloud of witnesses, the community of believers? Is it not those who pray in silence this very day for the conversion of sinners, the salvation of souls, the release of those in purgatory, the return to a unified Church? Is it not those who suffer each and every day for the sake of Christ? We will never really know exactly who, at least not while we walk within these “earthen vessels” we call bodies—not while we continue our pilgrimage through this valley of tears and wage our military-like mission against the powers of darkness. We will never know while here on earth just how many fish are laid upon the fiery altar each new day, just how many join Jesus in His one perfect offering, just how many “share in his glory” because they “share in his suffering”. But God does know, and he orchestrates it all. He knows exactly how many, and who. He misses not a tear, not a moan, not the slightest prick of a pin. He knows each and every one of His silent, unknown martyrs—those whose suffering “completes” what is “lacking in Christ’s afflictions”. Let us then join the breakfast feast. And let us not only eat but add to the meal. And let us dare to wonder with true childlike joy and adoration. Let us wonder who it is that is already laid upon those ancient coals as the apostles approach that gloriously simple meal on the shining shore of a most placid sea. Is the fish already in place Jesus Himself? Jesus who is priest and sacrifice and altar? Yes. Of course it is Him. But perhaps it is someone else too. Perhaps among that first batch of fish is also the first follower of Christ: the first to surrender all “possessions”, the first to pick up the cross daily, the first to follow Jesus through the completion of His Passion. Yes, perhaps it is Mary, His mother, His first disciple…our mother and the queen of all apostles. And perhaps it is also that “upright” man whom Jesus Himself saw as a father, the “righteous” Joseph who suffered so much in the name of Jesus. Perhaps that first batch contains all three: Jesus, Mary, and Joseph, that most blessed of families—The Holy Trinity “made flesh”—The One Triune God dwelling in a humble hut in a little town named Nazareth. In that sense, perhaps that first batch of fish is also you and me, your family and mine—and perhaps then “our” little “sacrifice” is already being offered up, right here in each of our “humble” homes and within the boundary lines of our own “Nazareths”. Perhaps that first batch is waiting to be joined to all other offerings, to be joined together with all the other individuals and families that are called to be a “living sacrifice”. Perhaps that first batch is within each one of us and is longing to be united to the one true sacrifice—the sacrifice of God’s crucified love, eternally offered upon the white-hot coals of God’s infinite charity. This entry was posted in art, Inspiration, Motivational, Religion, spirituality and tagged Catholic, Chagall, Christ, Christianity, Cross, faith, family, God, hope, Howard Hain, internet, Jesus, life, love, Mass, Passion, prayer, Resurrection on April 21, 2017 by vhoagland.